For the ten months of the Textile Arts Center AIR Residency program, I will share, learn and grow alongside seven extraordinary talented artists. Here they are! Christi's work spans from textile art to jewelry to sculpture, all inspired by nature and shapes inherently formed in our minds and in the greater cosmos. The inconsistencies in the forms of nature are combined with sacred geometry in an attempt to find a perfect balance of raw and refined. In wearable art, the interaction of rigid geometric forms with the organic human form pose an opportunity to create a harmony between the two. With this harmony in mind, the jewelry is created in an attempt to conjure positive emotions, hopes, and dreams of the wearer. She was raised in Jupiter, a small beach town in South Florida, and spent 10 years in Los Angeles as a fashion designer, most recently designing cosmic embroideries for Coast-Wide. In mid-2014 a series of happy accidents occurred that sent her across the country to a skylit studio in NYC and gave her the opportunity to become a full time artist/designer/jeweler. She also started a collection of few-of-a-kind clothing and soft goods called Made of Dreams Designs. Drawn to the art of craft, not only does Aimee Mclaughlin revel in the repetitive potential of pattern, but also craves the tactile processes of dyeing, printing, sewing and weaving. Manipulating print and color, she thrives to create fabrics that inspire elegance and provoke wonder. 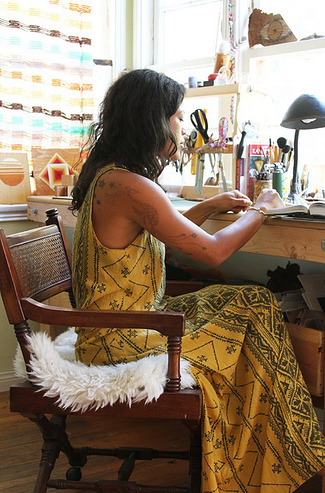 Aimee is a textile artist and designer working and living in Brooklyn, New York. She received her bachelor degree of fine art in fabric design and double minors in spanish and philosophy from the University of Georgia. 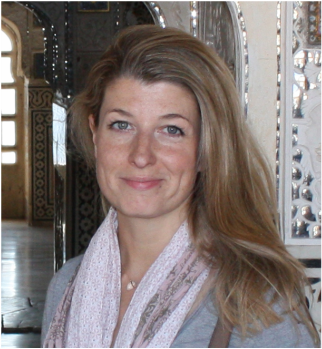 She has designed for several textile companies in New York and Georgia, which provide her with tangible insight into the developing world of sustainable design. Lately, Aimee spends her studio time dying small bathes of silk fabric in overly saturated baths. She then hand prints infinitely simple linocut block onto their surface in tonally hued colors. She also experiments with painting on dyed silk and is always musing over her next repetitions. Iris Plaitakis is a fine artist based in Athens, Greece. From automatic drawing in pen and ink, on paper or found objects, to paper/fabric constructions displayed in cabinets as curios, her practice negotiates the boundaries of pattern and explores such notions as the visual experience, intimate space, collecting, how objects are ascribed with meaning as well as the memory inherent in material things. Iris’ background in archaeology and art history informs her engagement with material culture and her interest in diverse decorative traditions. Textiles and textile techniques have always played an important role in her process and more recently she has expanded her practice into designing her own textile prints. As artist in residence at the Textile Arts Center, she will be concentrating on her textile print design and realization on fabric. Iris’ work has been featured in group exhibitions throughout Europe. She has been an educator in museums for the past fifteen years. She is co-founder and co-director of the Athens-based artist-run non-profit organization Lo and Behold. Yoshiyuki Minami weaves, sews, dyes and knits, only with the things that are minimally and naturally processed.Organic, fair-trade, local, and small quantities is what he is after with an intention to offer an alternative business model where the primary focus isn't solely its profitability. He adamantly refuses the use of synthetic dyes and animal materials. His clothes are meant to be comfortable and worn-out; they are meant not to overpower the wearers' stories, but to quietly accompany them. He hopes to make our world a better place. Alayna comes from a background in geography and archaeology. She has worked in the Arctic Studies Center at the Smithsonian Institute and in the field of Native American grave repatriation. Alayna transitioned to the textile world via quilting maps with the Brooklyn design studio Haptic Lab. She recently launched Absorka, a collection of naturally dyed and handwoven clothing. Likely the result of growing up in Montana, her creative practice is predominately influenced by western landscapes and earth science. Alayna now resides in Brooklyn where she cooperatively owns and operates a bed & breakfast. Emelie Rondahl lives and works in Gothenburg, Sweden. She earned an MFA in Textile Art at University of Craft and Design (HDK), University of Gothenburg. Her background also includes two years of studying traditional Swedish weaving. Hannah Shell Schultz is a Textile Designer and specialty screen printing consultant working out of Brooklyn, NY. She is a motivated collaborator with the ability to complete tasks in fast-paced, deadline oriented environments; forever embracing any creative challenge. Anne-Marie uses a combination of computational design, electronics and digital fabrication to revisit the crafts heritage of her native county near Québec City. Her process is towards the tangible, traditional, and sensual and she uses fibers as components in compelling designs and interactive interfaces. She is inspired by the mutually informative histories of textiles and communications, and explores a fiber’s ability to transmit knowledge and emotion through visual and tactile interactions. Anne-Marie is an alumni from the Interactive Telecommunications Program of NYU TISCH School of Arts and currently researches woven circuitry, conductive inks and thermochromic dyes. She was selected for the 2014-2015 artist in residence program at the Textile Arts Center in Brooklyn, for which she received the Ruth Schirson Levin Award. Anne-Marie's projects and collaboration were shown at the MET Museum, Tribeca, IDFA Doclab, FNC Film Festival and have appeared in Forbes, Make Magazine, Fast Company, Indiewire, The New York Times amongst others.